The 'SSL/HTTPS' security setting allows you to view and modify settings relating to SSL certificates and security protocols. 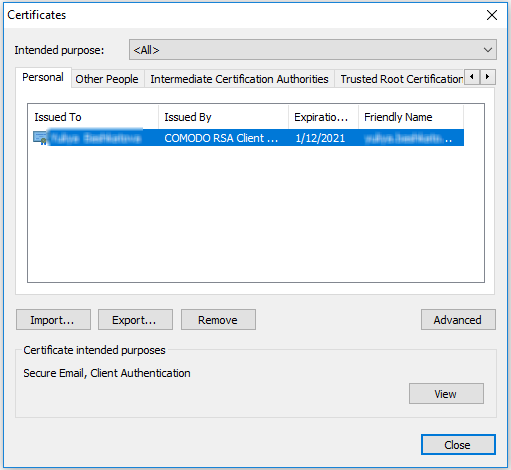 This allows you to view, import, export or remove personal certificates and other peoples certificates as well as manage the built in list of trusted root certificate authorities. Personal - displays your own client/secure-email certificates. Other People - displays a list of client certificates belonging to other people (usually your contacts). Intermediate Certificate Authorities – displays a list of intermediate certificates. This type of certificate forms a link in the chain of trust between a certificate on a website and a trusted root certificate. Trusted Root Certification Authorities – displays a list of trusted root certificates. Trusted Publishers – A publisher is a developer who has created a macro, ActiveX control, add-in, or other application extension for use by you and other people. Trusted publishers are reputable developers. Untrusted Publishers - a list of untrusted publishers. The dialog enables you to: Import, Export, Remove your certificates. Select the file you want to import and click 'Next'. Choose a password which you can remember later. Click 'Next', then check 'Mark this key as exportable. This will allow you to back up or transport your keys at a later time' and 'Include all extended properties'. 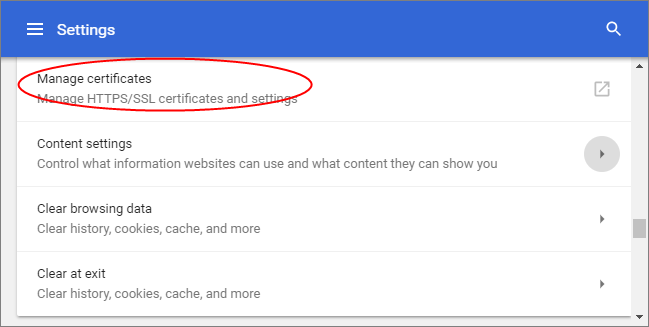 Select Personal Certificate Store you want to save the certificate to. You will see a confirmation screen listing the settings you have chosen. Click 'Back' if you wish to amend any details. Click 'Finish' to import the certificate. Once finished, the certificate and associated private key is saved as a .pfx file. You can export this into other browsers and mail clients as required. On the 'Personal' tab, select the certificate you wish to back up and click ‘Export’. Follow the Certificate Export wizard. Choose a password which you can remember later. Click 'Next'. First create a file-name for the exported .pfx then click the 'Browse' button to choose where you want to save the file to. You will see a confirmation screen listing the settings you have chosen. Click 'Back' if you wish to amend any details. Click 'Finish' to export the certificate. Once finished, the certificate and associated private key is saved as a .pfx file. You can import this into other browsers and mail clients as required. Select the certificate to be deleted and click 'Remove'. Click 'Yes' in the confirmation dialog. The advanced options dialog displays a list of certificate purposes under 'Advanced Purposes'.